I've been eating out a bit lately, and I thought I would share two lovely experiences I have had over the last few months. The Dayboro Deli is located an hour or so out of Brisbane in the town of Dayboro. A few months ago they held a series of four dinners, each focusing on a different 'food'. The first of the nights was a vegetable night, and they decided to make it all vegan. Of course I had to go! Driving to and from Dayboro in the dark was kind of terrifying - even with my high beams on it was pitch black! But it was worth it for a lovely dinner. 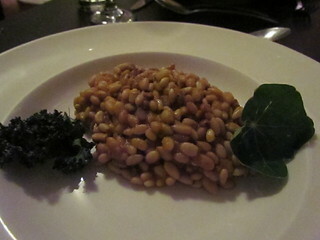 The first course was 'Pine Nut and Sweet Potato Risotto with Crispy Kale'. 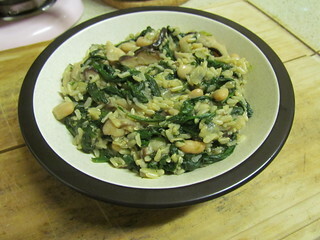 This was a risotto made actually of pine nuts! A very nifty idea. The flavour was good, though as it cooled down it was quite rich. It came with a bit of crispy kale, which was amazing! 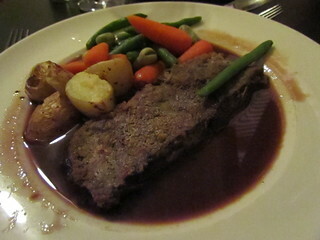 The main course was 'Portobello Steak with Vegemite and Red Wine Jus and Baby Vegetable Medley'. As vegans, portobello steaks are nothing out of the ordinary. However this was a steak made from minced mushroom that was bound together and cooked. Mixed with the delicious jus, it was a great combination! 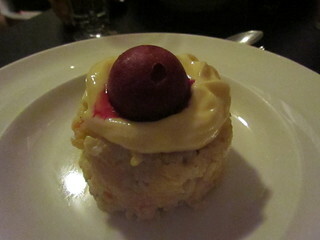 Dessert was 'Coconut Milk Kheer Pudding with Carrot, Orange Mousse and Beetroot Sorbet'. The beetroot sorbet was kind of like eating a frozen baby beetroot from a can in flavour, but all together it really worked. All up it was a great night, well worth the trip out there. I really enjoyed how the chef was quite inventive with how he made the dinners, it is great to see that sort of effort put in to vegan food and omni places! One of the nurses at work goes out with one of the owners and chefs of The Statler and Waldorf Gastronomy Club in Paddington. On a regular day, the menu will have a couple of vegetarian options, however vegan not so much. However, when Lisa arranged for our work Christmas party to be held there, they were able to put together a delicious array of share plates that were mostly vegan. This salad was probably the favourite of the table, a Waldorf Salad. 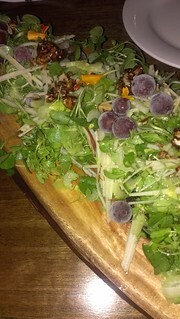 Greens, shredded apple, candied walnuts and frozen grapes (and other things as well I am sure), forks were crossed trying to scrape the last of this amazing salad off the boards and onto our plates, or just directly into our stomachs. I loved the frozen grapes! 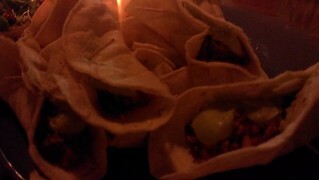 Coming in second by just the merest of a whisper were these amazing quinoa and eggplant tacos with avocado cream. So. Frakking. Good. I could have devoured a whole plate. Actually, these probably tied for first with the salad for me. After this I gave up taking photos, because the whole low light/bright flash thing was really frustrating. You can see how bad this photo is! 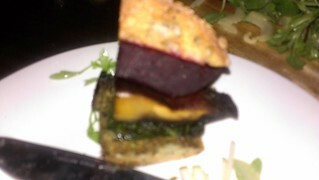 It is a photo of a little quartered beet and portobello slider (yum!). In the 'I did not take a picture' category there was also some lovely artichoke bruschetta - where the artichokes took the place of the bread and had a zesty topping. And a giant pot of sweet potato chips with more avocado cream. This was an amazing dinner! I was so happy and full after this. I would recommend checking out Statler and Waldorf should the opportunity arise - just be sure to call in advance so they can put together a great vegan menu! Even if you aren't vegan, if everyone keeps asking for those amazing tacos maybe they will put it on the menu permanently? YUM! 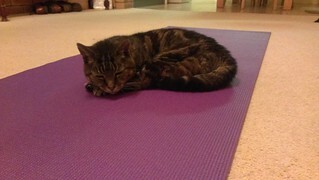 Cats love yoga mats, and they love yoga poses. Here is Possum practicing a very important pose - Resting Cat. 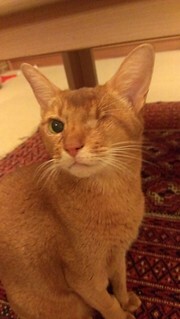 Possum turned nineteen years old in September, he is amazing! On to the second part of my initial round-up of One-Dish Vegan, by the magnificent Robin Robertson. This dish is a great reminder that you don't need complex ingredients for great flavour. Initially I was worried this might be a bit bland, but I was so wrong. This is a beautiful dish, which I served over kale. 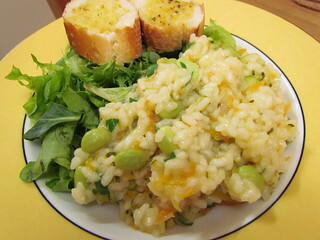 This is a very filling dish, with a lovely orange flavour and gentle heat. I only used one chipotle (which I seeded) to make it Susan spice level approved. Another dish that is generous with the serving sizes! 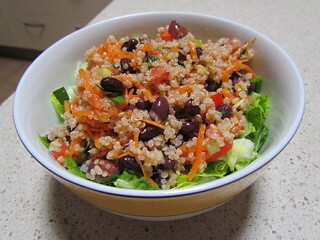 There's something so fun about eating shredded vegetables, plus with quinoa and black beans it will fill you up and give you that protein omnivores are always so concerned about. Great with nooch! This is amazing, and will definitely have you going back for seconds. I got three big servings out of this, and that was only with great restraint (I really wanted to eat more!). I love puttanesca, something about all those olives and capers and tomato and pasta. This version has finely chopped zucchini in it as well, which is lovely. I accidentally had bought green olives with pips, so I had to slice my olives off around them. Annoying! But worth it. Sprinkle with nooch. 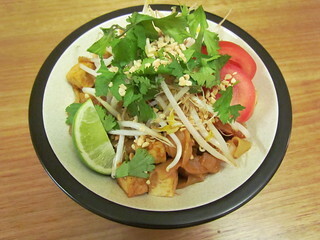 I always gravitate towards Pad Thai recipes in cookbooks (any excuse to bust out my tamarind paste! ), and this did not disappoint. I love all the toppings on it as well. 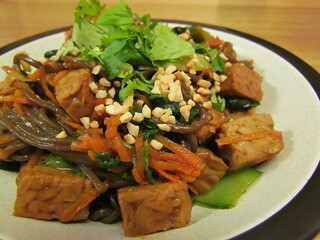 Hoisin, tempeh and soba noodles... three of my favourite things! 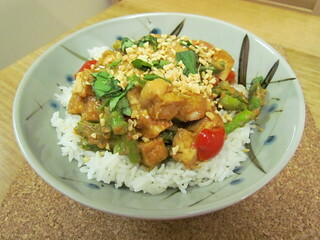 This recipe is definitely one to keep coming back to, even my tempeh suspicious dad enjoyed it. The recipe calls for 8oz of tempeh (about 250g) but I had a 300g block so I just used it all and increased the amount of sauce (by using 20mL Australian TBS instead of 15mL US TBS when I was measuring out the ingredients for it). Another totally awesome dinner. 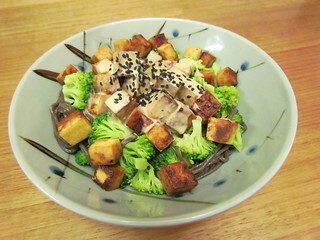 I can't get enough of soba, and I also love tofu and broccoli and tahini. Tahini and miso sauce has got to be one of the best combinations out there. A great lasagna, I did make a few modifications. I can't find non-instant lasagne noodles that don't have eggs in them, so I used instant (which worked fine). I also used 1/4 cup of water with 1/8 tsp of guar gum in place of the oil in the pesto, just because I was feeling like being oil-free. 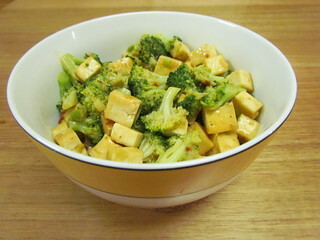 The recipe calls for 1 pound of firm tofu, but I had 375g firm tofu and 100g of left-over silken in my fridge so I used a combination. This is a great recipe, and surprisingly filling! You MUST buy the book for this recipe, if for no other reason. This was one that was frequently mentioned in the teaser posts leading up to the book, and oh my goodness it was everything that I hoped and dreamed. Noodles, vegetables, a white bean sauce that is a little bit peanut a little bit cheesy... heaven! I could eat an entire recipe of this!! 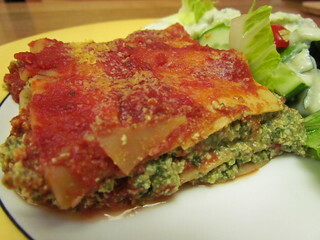 This is an unusual lasagna, but one that makes a nice change from the regular variations. The recipe calls for butternut squash thinly sliced, I wasn't sure how it was meant to be sliced (rings? quarters? slabs?) so I think that I just cut it into thin rectangular slices as it was being sauteed. 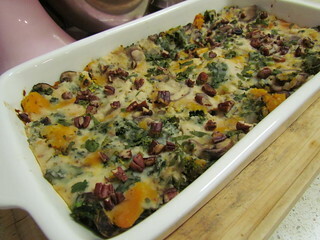 It also has kale and mushrooms, yum! 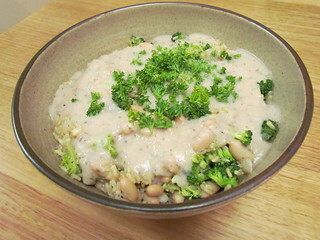 The sauce is a blended white bean sauce, and it is topped with toasted pecans for crunch. This is a fun dish bursting with flavours and different ingredients. It bakes up perfectly (no issue with the rice not cooking here) and makes six giant servings, so lots leftover for lunches during the week. I have made other dishes as well, though the photos are still on my camera, and there are lots more that I am keen to make. Bahn Mizza and the Tofu, Potato, and Cauliflower Piccata Bowl are at the top of my still to make list. I recommend everyone get their hands on a copy of this book, as I think it will suit vegans and omnis alike, with any level of cooking experience. Dim Sim sleeping in her fluffy pink bed. The bed itself is made out of such a soft, smooth fluffy material that Dim Sim kind of finds it a bit strange, so I have had to put a crocheted blanket into the base of it to make it fit her exacting requirements. Wow, it has been just over two years since I last posted a 'Recipe Round-Up' post. But even though there has been a long time between posting, I haven't stopped cooking! One-Dish Vegan is the latest cookbook published by Robin Robertson, who is my favourite vegan cookbook author. I knew about this book for months before it was published, pre-ordered it early and then waited patiently by my mailbox for it to arrive. I was not disappointed! One-Dish Vegan is packed full of a fantastic array of tasty recipes. 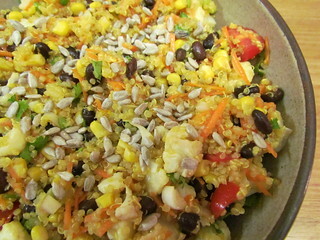 It has a focus on wholefoods, so lots of grains, beans, tofu, tempeh and vegetables. There are a few dishes that call for seitan or vegan sausages, and only one or two that have an option of vegan cheese. 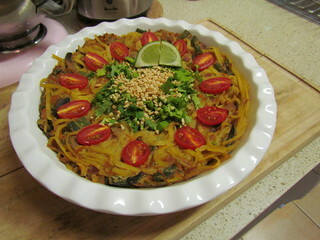 The premise of the book is recipes that can be served in the one dish, though they are not all one pot. Some do dirty up a few pots and pans along the way, but there is nothing complicated. There are no photos in the book (except for on the cover), but this is not something that bothers me. Make the recipes and you can take you own photos. :) There are no starters or desserts here, just filling savoury dishes. Chapters include Soups That Make A Meal, Main-Dish Salads, Stovetop Simmers or Stews, Chili Today, Sautes and Stir-Fries, Pasta Plus, and Oven to Table. I have been using this book a lot in the short time that I have had it, so I will split this into two posts. There are so many great sounding recipes! 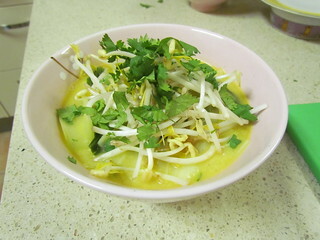 This yummy laksa-type soup provides four giant servings of goodness. It calls for extra-firm tofu, which is what I used, but if you have access to fried tofu puffs these would be great here. 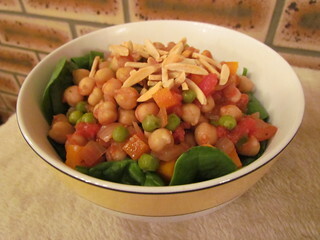 This salad is an absolute delight - amazing flavour in every bite! 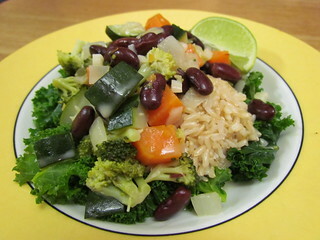 Wild and brown rice are mixed with celery, carrot, peas, scallions, artichoke hearts, tomatoes and beans. There are a few options of fresh herbs to use and I chose dill, which was fantastic. Cauliflower is the key to this great salad. 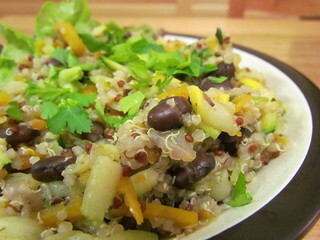 Rather than cooking mine with the quinoa, I roasted it for extra awesome flavour. I didn't use yellow capsicum (because capsicum is ewww), and instead cut the kernels off a cob of corn and added it to the quinoa for the last few minutes. 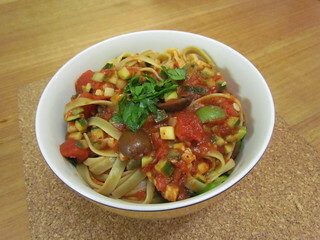 Again there is a choice of herbs, and I used coriander. 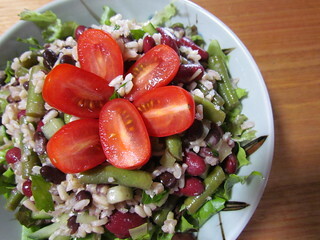 Green beans, kidney beans and black beans are the three beans in this substantial salad. The recipe calls for pimientos, which I am yet to find here, so I just left them out. The first salad I picked from this book, it comes together in a flash and is full of great flavours. I should mention that all of the salads here keep well to take to work for lunches throughout the week. The first recipe I made! White beans are blended up to make a great lemony sauce. I found that I needed to cook the broccoli for a little bit more to make sure if cooked all the way though, and I added some extra white beans to the rice and broccoli (as suggested in the recipe notes) to make it a bit more substantial. When you find yourself with two bags of aborio rice, you have to make risotto. Carrot, zucchini and edamame are included here. The recipe suggested serving with salad and garlic bread, which I did. And of course I sprinkled liberally with nooch! 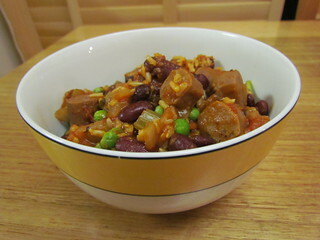 Jambalaya is fun to say and fun to eat! The recipe called for 20 minutes to cook the rice, but my rice took much longer to cook. I always find this with cooked rice dishes! But after some patience I was rewarded with a great dinner. 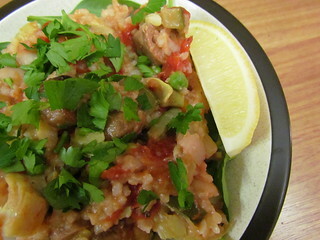 I didn't use the capsicum but added some green peas at the end when you add the sausages. Another dish that is generous in the serving sizes. The sauce has a lovely blend of spices that get soaked up by couscous. 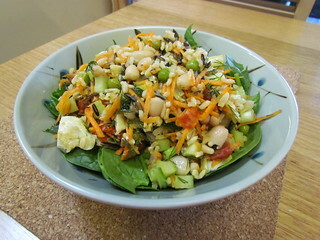 There is the option of topping with toasted almonds or scallions, and I chose almonds which gave a lovely crunch. Is there anything in the title of this dish that is not good? Again I needed a bit more time and liquid for the rice to cook all the way through, but then I enjoyed a fantastic dinner. I chose dill as the herb option, because you should always choose dill. This book has an entire chapter of chili recipes, though being a bit of a spice wimp I am slow to move through them. But when I do I will shameless decrease the heat in it until it gives me just a nice mild warmth. 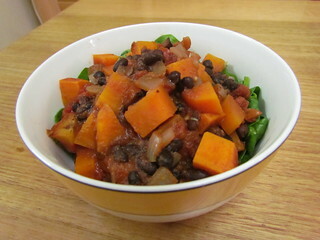 Sweet potatoes and black beans are a great combination. I only used one chipotle chile instead of two, and also decreased the amount of chili powder (in Australia our chili powder is much hotter than the powders in the US). Tomorrow I will be back to post the second part of my initial round-up of this fantastic book. Trying to take photos of cats can be tricky, they always seem to know how to move just as you are about to press the button! I was trying to take a photo of Sahara to send to Leigh (who is a great admirer of the red cat), and she was moving everywhere. 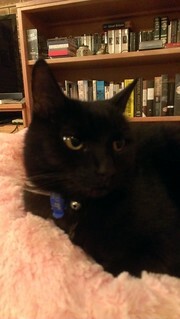 But somehow I managed to snap this photo of her sitting pretty.